We are proud to partner up with Modesto Junior College this year for our upcoming Latino Comics Expo! 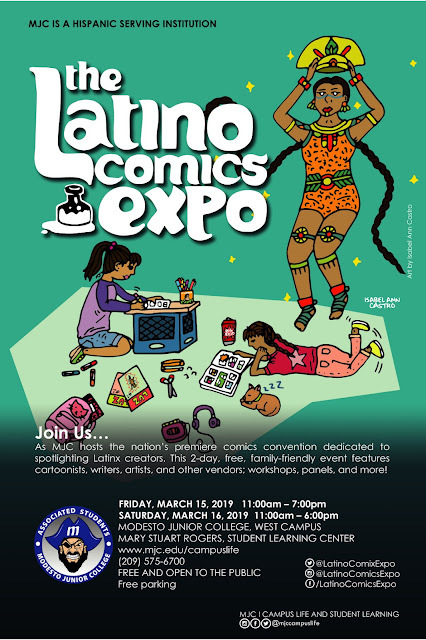 Join us for this free, family friendly event as we once again present you two full days of comics and culture, plus exhibitors, panels, workshops and all the fun you've come to expect from the Latino Comics Expo! Click on the tab above for the programming schedule for both days. Our complete exhibitor list will be posted shortly. And here's our poster featuring artwork by one of our guests, Isabel Ann Castro! Our headlining special guests are Jaime Hernandez and Gilbert Hernandez, the two co-creators of the legendary comic book series LOVE AND ROCKETS. Our other guest creators include Cathy Camper of the LOWRIDERS IN SPACE book series, Eisner Award winning scholar Frederick Luis Aldama, bestselling YA author Isabel Quintero, children's book author Rhode Montijo, cartoonists Rafael Navarro, Crystal Gonzalez, Jaime Crespo, Breena Nuñez, Eric J. Garcia and a veritable host of writers, artists, podcasters, publishers and more! The Latino Comics Expo was founded in 2011 by Ricardo Padilla and Javier Hernandez. Our goal was to gather together a group of Latino comics creators and fans for a weekend to celebrate both comics and culture. Our first event was held in San Francisco at the Cartoon Art Museum on May 7th & 8th, 2011. Since then we've held other California shows in San Jose and Long Beach, as well as Brownsville, TX. For this, our 9th convention, we're excited to be teaming up with Modesto Jr. College in Modesto, CA as we once again return to the Bay Area. Our co-organizer, Dr. Theresa Rojas, has helped us put together an amazing show featuring a variety of talents from the world of comics, graphic novels, illustration, design, academia and other fields and art forms. Please make plans to join this March 15 & 16, 2019 for this free and family friendly event!